So I think I'm pretty real with you in sharing my lessons learned, journey to becoming a 6 figure business coach, what it's like being a mompreneur etc. But I went to yoga last night and that always brings things up for me. What I've really been feeling is that I want to share the day to day stuff. I want to share my struggles and lessons more as I'm going through them. I think we really need that in the online industry. I'm not perfect in any way. I'm a human just like you going through struggles, pain, joy, frustration, challenges, successes and all the feelings. I've always wanted my brand to be a personal brand...like deeply personal, highly creative, and sharing every piece of me. I've had a baby. I'm 27. And I think I'm finally ready to do that. There's something that changed for me over the last couple years where I just don't care what people think anymore. I just can't. I can't hide my thoughts, ideas, and quirky personality behind what I think will sell. So I think that this, what I'm sharing today, is just another level of that. I want you to know that no matter what you have going on in your life, you can have big success. You can create whatever vision you have for yourself! I think that we all have wobbles in our life. I've had wobbles in my marriage, with coaches, with clients, with health, with mindset, and with being a mom. Even though those things are going on in the background and I'm handling them, I am STILL creating multiple 6 figures, working on scaling to 7 figures, being more present, getting my mindset in check, and buying an airstream to travel in next year. I'm still creating the vision even though I'm being a human living a human experience. It's what we're ALL doing, but sometimes who we are just gets lost in the online space. Here's what I've found. When we actually share what is really going on, we actually feel more free, more loved and more loving. We connect with people even more deeply because we feel seen and others can see who we really are. It doesn't mean that I'm going to be showing up in your inbox as negative nancy. It just means that along with sharing perspective shifts, I'm going to be giving you the raw and real deal life and business stuff. My hope is that you'll see that no matter where you are in your business and life, you can create anything you set your mind to. I truly believe that you can. Your Sales Just Stopped?? 😱Watch this. If you missed this live stream, you'll definitely want to hop on this replay, real quick! I'm talking about the biggest challenge I see that stops momentum (dip in sales, dead halt in clients) and what to do about it! Want to know if this 30 minutes will be worthwhile?? Obviously, it will be!! 😜Just in case though, check out my notes from the live stream. The Biggest Challenge I see that stops momentum (dips in sales, dead halt in clients) and what to do about it! THE THING: Your mind not being made up about selling and selling until you meet your goal. Focusing on the one client who left or the one hate email or the one client who didn't get results. They probably didn't go all in with something. Haven't really looked at why it's unique or why it works. I need to be clearer on my ideal client before I market -- even though I've done 100 worksheets about my avatar. >> Allowing the thoughts to take over that say it's not possible -- from past programing. What are you consuming? Decide. Affirm, journal -- do the things to get your belief into THIS IS WHAT'S HAPPENING. We are magnets walking around -- when your thoughts and energy are on something (aka belief) it is attracted to you AND you get ideas of what to take action on that help also attract it to you. PS Have you enrolled in Intuitive Success yet?? This is my signature 90 day program where I teach you how to create a simple, scalable, impactful online business. It's not just like every other business coaching program. What I'm teaching you comes straight from my last three years as a multiple 6-figure entrepreneur working with 6 and 7-figure business owners to help them create success that is aligned....aka success + happiness! Check it out and if you have questions send us a message. Why I'm making Quizzes To Grow My Email List! 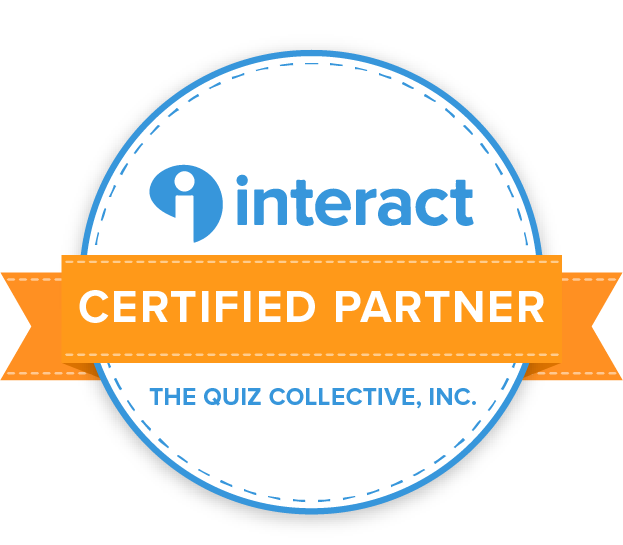 A few weeks ago a company called Interact approached me about partnering with them to start adding quizzes to the way that I grow my community and build my email list. I was definitely intrigued, but kind of thought…is this like those spammy quizzes that went all over Facebook for a while, until they decided to clean up our feeds? Once I got into the platform and started creating my quiz I became kind of obsessed. Like literally, I’m obsessed with these quizzes. As a multi 6 figure business coach I know what works and what doesn’t in business. The thing about a quiz that’s really cool is that it gets your potential client to interact with your content (hence the company name 😜). When someone clicks once on a piece of content that you have, they are more likely to keep clicking and keep learning. This helps you build your know, like, and trust factor because with every click comes more knowledge about you, most trust in you, and if you put your personality into your quiz, they’ll probably even start to fall in love a little too! Definitely in the good way, not the creepy way. Here’s the thing you should know about me. If I can’t get behind something, I legit can’t sell it. It’s like the words don’t come out of my mouth because I feel so gross lying. It’s true. I’d rather not say anything at all, than lie through my teeth. So it was kind of a big step for me to say — hey Interact, yes I am going to partner with you! Why did I say yes to this company specifically? For a few reasons. And I always trust my intuition, so this felt like a big yes for me! I thought you might have a few questions about how I actually came up with my quiz and about the product so I wanted to answer those for you. The quiz that I created is actually for the second business that I recently started with a vegan wellness and skincare company. People always want to know what style they are so that they can choose the best products for them so I thought this would be the perfect opportunity to create a quiz. How did I come up with my quiz? So I knew that I wanted to make a quiz about self care because it’s a huge part of what makes my business go around! It’s also a smart business move because I can use the quiz to get people interested in the wellness company that I’m a part of, which can lead to products sold and new team members. That means more residual income and lives changed! It’s really nice that Interact has templates for you to use so that you don’t have to create everything yourself. It makes the process way quicker. How did I choose a template? I chose the template about cosmetics because it was a simple 4 question quiz that I knew anyone interested in self care could quickly take and get value from. How did I come up with my questions? This part was a little more tough for me because I’d never done it before, but once I got into it, it was a lot easier. To decide on my questions, I thought about the outcome of self care and how people actually get to that place. I was looking at the problem and the solution of self care! Usually people are stressed out when they don’t have it and are happy when they do. So I made sure to ask simple, quick questions that addressed both of these things. How did I come up with my results? I knew that the five types of self care I wanted to direct people to were financial, physical, emotional, spiritual, and social. So I thought about what those really meant and why people use them to feel good. Then I made sure to add suggestions of how to do this within each result page. Not only are you finding out what self care style you are, but you’re learning how to implement more of this type of self care into your life. Then at the bottom of each answer page I have a link that you can click to learn more about either working with me or products to support your self care style. It’s pretty cool! What email marketing system do I use? I use Convertkit for email marketing. I’ve used almost all of the major platforms and Convertkit is my favorite. Interact makes it super easy to integrate Convertkit with your quiz. Personally I chose to make it so that anyone who takes my quiz gets added to the same form within Converkit, even if they have a different self care style. I like to keep it simple! That way I can email everyone who has taken the quiz about the opportunity to partner with me, new products, and special events. However, I thought that it was really freakin cool that Interact actually lets you add different people to different forms. So let’s say that one persons self care style is financial and other is spiritual. I could send the spiritual people emails about spiritual products only and the financial folks emails about the business opportunity. The same feature is available for the answers that people give. Where am I using this quiz? I’ve decided to use this quiz as a stand alone page, hosted on Interact. Legit, I didn’t need to put this on my own website or anything! If you did though, you could use a resource like this to help you: How To Embed A Quiz On Any Website. You can check out what it looks like here. The two ways that I’m driving traffic to it are through Instagram and Facebook ads. So I will add the link to my instagram links (as seen below) and then have an ad with $10 a day running to it. What have my results been? Again, I can’t lie. I actually JUST put this into place in my business, but I’ll be sure to make an update on this post as results start rolling in. Here’s what the analytics look like for each of your quizzes. I think that this is a really great option for you if you’re wanting to grow your email list and do it in a way that is fun and interactive for your audience. If you’re just starting your business and want to keep it simple, I’d stick with building your community via live video on Facebook and Instagram with one opt in. If you’re expanding your list or looking to rapidly grow your community, Interact could be a really amazing way to do that! Alright, sis! I’m giving it to you straight and telling you why you’re likely not making the sales that you want to be making. It’s honest. It might not be what you want to hear. And I think that this is the hardest thing about business, but once you know that it’s in your control and you can easily change it…YOU. ARE. GOLDEN. P.S. If you liked this video, share it with someone else who needs this message!